Torch Red 2003 Cobra 10th Anniversary coupe owned by Craig Davis. Craig displayed his car at the "6th Fight Against MS Car Show" held in Princeville, Illinois on April 18, 2009. A total of 2003 of these where built. They came with special 17x9 inch wheels, red and carbon fiber interior accents, and special 10th Anniversary badge on the trunk lid. 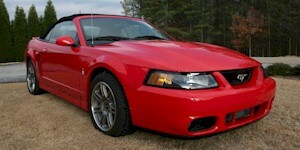 Torch Red Mustang 10th Anniversary SVT Cobra convertible with a black interior and black top. It has the 390hp 4.6L DOHC 32v V8 engine and the 6-speed Tremec T56 manual transmission. This Cobra has the 10th SVT Cobra anniversary red brake calipers in all for corners and 10th Anniversary 17x9 inch wheels. Silver metallic 2003 10th Anniversary SVT Cobra convertible with 17 x 9 inch special SVT Cobra wheels, red brake calipers, black interior with red leather inserts, special carbon fiber weave leather steering wheel, 10th Anniversary decklid badge and floor mats, and a modified 4.6L supercharged V8 engine.